No one wants to live in a cluttered house where your eyes have no place to rest. It gets difficult to relax when you see that the floor is cluttered, with clothes and toys, and surfaces are sticky and dirty. It just makes you want to camp outside for a change of scenery and for a break in the stress you are feeling from all the mess you constantly have to deal with inside the house. This scenario is not uncommon for people with a busy family life. We get it, you have a myriad of house chores on your list such as making breakfast for your spouse and preparing school snacks for the kids that you barely have any extra time to keep up with all the cleaning tasks. So you may be asking, “Is it really possible to achieve an organized home with kids?” The answer is YES. While you may think that a cluttered living space is the reality you have to live with, believe us when we say that it is possible to keep dirt and mess at a minimum even when you have kids at home who like playing in the living area, and leaving toys lying around in bizarre places. 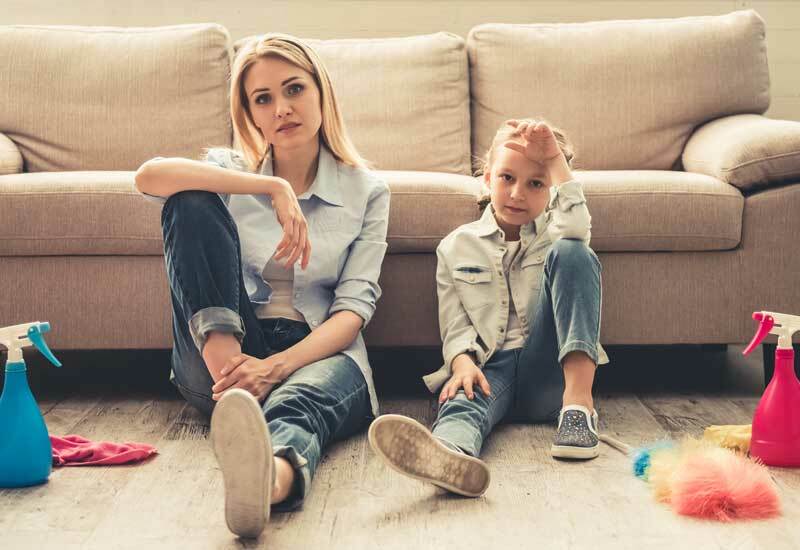 So before you give up on your efforts to keep a tidy abode with kids, consider the simple steps you can take every day that will help you manage cleaning chores more effectively, and will allow you to enjoy your home more. Sticky surfaces can be wiped clean, and dirty floors can be mopped to look shiny again. But toys, school paperwork, and dirty clothes the are scattered everywhere can easily make your home look like a complete mess. One simple way you can keep clutter at bay is to prioritize cleaning tasks that can be done in just a couple of minutes. This includes taking out the trash, putting dirty clothes in the hamper, shaking out your welcome mat, and sweeping the front step. You will find that it is so much easier to do a thorough cleaning of the house once all the small tasks have been taken care of. Also, do not think that you have to do all the cleaning chores on your own. You can outsource some of the cleaning tasks to professional cleaners who can take over some of the more challenging tasks such as disinfecting the toilet, and getting dirt off hard to reach areas. Teaching your kids to put away their stuff is a challenging undertaking. For one, they will likely find the chore boring and tedious, because there is simply no fun in placing toys back or even sweeping the playroom. If you want to help your kids develop the habit of organizing their things, try to make the chores exciting for them. Do a role playing game in which you and your children are professional cleaners working on tidying up the house. You can also hold a contest in which they will race to put away their toys at the shortest time possible. Whoever wins will get to pick what dinner you will make, or what movie the family will watch. The way you manage your time can have a significant impact on how much house work you can finish in a given day. We have found that it helps to break housekeeping chores into manageable tasks that you can work on over a 5-day or 7-day period. For example, you may choose to do the laundry on Mondays, garbage recycling on Tuesdays, cleaning the bathroom on Wednesdays, and so on. Breaking down chores can make the tasks more manageable compared with doing a top-to-bottom cleaning of the whole house in one day. Note that you can always take a rest from your cleaning chores in the middle of the week, so you will have time to enjoy your hobbies or to simply recharge your mind and body. There is absolutely nothing wrong with wanting to keep a spotless clean home. But at times, you have to realize that there are other important aspects of life that you should make more time for. When was the last time you simply sat on the porch to enjoy the view? Do you spend more time trying to get the house to look presentable than taking time to staying connected to the people or things that make you feel most joyful? While tidying up the home is a task that cannot be disregarded, set limits to the things that you can do in a day. Know when to seek help with the chores, and consider hiring professionals to perform a regular cleaning of your abode, so you can take time to rest and reduce the stress that comes with keeping up with the demands of your busy family life. You may be trying hard not to trip over your kid’s toys and school workbooks on a daily basis, just because your kids do not know where to place their belongings. To make organization easier, you have to be more creative in storing their things to prevent your home from looking like one giant playground. The first step to organizing your home is to have a conversation with your kids about the importance of keeping fewer toys and other items. Ask them which toys they use 90% of the time, and which ones they are willing to let go. Once they have selected the toys they will keep, make a “home” for these items, and instruct your kids to make it a point to put them back to storage boxes after every use. Keeping a tidy home when you have kids may seem like an uphill battle. But there are always simple steps you can take to make the task less overwhelming and to still have time for relaxation. 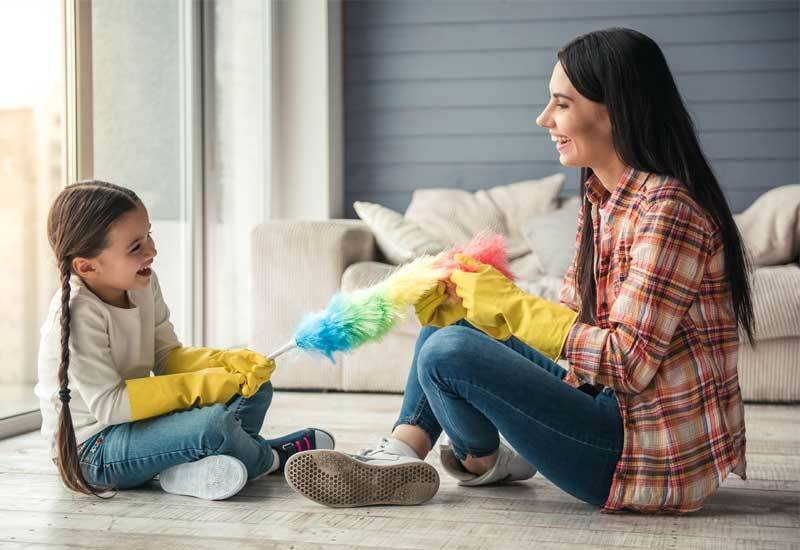 You will find that when you get the kids to help with some of the simple tasks, when you organize your cleaning chores, and when you hire trained cleaners to do a detail cleaning once a month, you are able to enjoy your home to the fullest without doing all the hard work alone.